I like Ephraim Fowler. I like his name and I like the fact that he left a well detailed will. Was he the oldest son of Henry Ellis Fowler? Before I attempt to answer that, we need to clear up a misconception about Ephraim. Many family trees have his date of birth as 1784. I am not sure of the logic behind this date as Ephraim was listed in the 1790 Union County census as head of household. If he were actually born in 1784, that would make him only 6 years old in 1790! In the 1800 census, Ephraim’s age was given in the 26 to 44 year old bracket. That would put his date of birth in the 1756 to 1774 range. Taking into consideration that his father Henry Ellis Fowler was born circa 1746, a date of birth for Ephraim of 1756 would not work, and the fact that Ephraim’s oldest son Jasper was born circa 1785, a date of birth of 1774 would not work either. I think it is logical and probable that Ephraim was born approximately 18-20 years after his father, and 18-20 years before his oldest son, putting his date of birth circa 1765. So, yes, I do think that Ephraim was the oldest son of Henry Ellis Fowler. I have learned from my trips to the Union County, SC Courthouse that Ephraim purchased land in the years 1794, 1817, and 1822. He sold land in 1806, 1811, 1815, and 1822. We know from his will that was recorded in 1822 that he left behind wife Nancy and ten children. I will get to Nancy at a later time. In the meantime, let’s take a look at his children. Ephraim mentioned daughter Betty early in the will. Ephraim also listed his remaining nine children in an interesting order. He did not list his sons first, and then his daughters. I believe that he listed them in the order of their ages. Later census records and the ages they began having their own children indicate that this is a correct assumption. 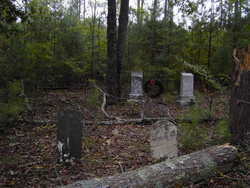 Jasper Fowler was born circa 1784/1785 and died circa 1841/1842. He was recorded in the 1810 census in the 16-25 age bracket, putting his date of birth 1785 to 1794. In 1820, he was age 16-44; in 1830, age 40-49; and in 1840, the last census that he would appear, he was in the 50-59 age bracket. This information “fits” the 1785 date of birth for Jasper, and also supports the fact that his father Ephraim could not have been born in 1784. Jasper and his yet unknown wife had at least six children, with the dates of their births ranging from 1803 to 1827. Jasper and his family will be studied in depth at a later time. We know from an estate settlement in 1842 that Jasper died between 1840 to 1842. His wife was still living in 1840. Lydia Fowler was Ephraim’s oldest daughter, and was born circa 1785/1786. We know from his will that she had already married Charles Hames by 1822. Census records indicate that Lydia and Charles had their many children between the years 1804 to possibly as late as 1830. Some of these children later moved to Georgia and some stayed in Union County to raise their children. Her husband Charles Hames died in 1847. Lydia was last found in the 1850 census living with her mother Nancy. Lydia died in Union County in 1852. John Fowler was the next child born to Ephraim and Nancy, and was more than likely born circa 1790. He married a woman named Nancy and they had at least three sons and two daughters. These five children were born between 1819 to 1830. I have only be able to find John in one census record……in 1830……living near his brothers Jasper and Stephen. John was 40-49; Jasper was 40-49; and younger brother Stephen was 30-39. I have not yet found John or Nancy in the 1840 census records, but Nancy was recorded in the 1850 census living with her married son Thomas and his wife Eleanor Hames Fowler. Two of Nancy and John’s other children, John and Rebecca, were in the household. This indicates that John had died before 1850. Sarah “Sallie” Fowler is next, and she was born circa 1791. She had married John M. Hames before Ephraim’s will of 1822. In fact, she and husband John had their children between 1812 to 1832. John died in 1862, and Sarah died after 1866. The last census record in which they can be found is 1860. They are both recorded as 70 years old. Mary “Polly” Fowler was the next child to bless the home of Ephraim and Nancy. She was born circa 1794 and married Richard White. I like Mary. Both she and husband Richard left wills. They are easily traced through census records. In 1830, Richard White and Mary Fowler White were living next to Mary’s widowed mother Nancy. Mary was recorded as being 30-39 years of age. Mary was age 40-49 in the 1840 census and the only other household member was husband Richard White. Richard and Mary did not have any children of their own but they were especially attached to Mary Jane Fowler, daughter of Mary’s brother Ellis and his wife Sarah Mabry. Perhaps Mary Jane was named after her aunt Mary. Regardless of the reason for the attachment, we know that it was real. Richard White penned his will in 1847, leaving “all of my estate to become the property of my wife Mary; at her death to Mary Jane Fowler niece of my wife and daughter of Ellis Fowler, deceased.” The will was recorded in 1849, leaving Mary Fowler White a widow. Widowed Mary Fowler White was head of household in the 1850 census and she was recorded as age 56. Her beloved niece Mary, age 17, was now living with her, as well as a woman that I have not been able to identify named Sarah Lovings. By 1860, Mary Jane Fowler had married Newton Lipsey and moved out of her aunt Mary’s home. Mary Fowler White was again head of household in 1860. Her age should have been 65, although it is difficult to make out and appears to be 55. She was still living with an unidentified Sarah Lovings. We are fortunate enough to also learn from this estate settlement that her sisters Sarah Hames, Elizabeth “Betsy” Bentley, and Milly Millwood were still living, as well as her brother Stephen Fowler. We learn for certain that brothers John and Ellis and sister Lydia Hames had already died. We also learn the names of the deceased sibling’s children: John’s children were Thomas, Charity,and Rebecca Burgess; the children of Ellis were Elbert, Henry Richard, Julia Sprouse, and Mary Lipsey; Lydia’s children were Coleman, William, Pressley, Joshua, Frank Hames, and daughter Mary Dunaway. The document, as far as I am concerned, is a goldmine of information. To read the document in its entirety, we learn which siblings, nieces and nephews had moved away and which ones had stayed put in Union County. Elizabeth “Betsy” Fowler Bentley was summoned to come to court all the way from Alabama. Ephraim’s son Steven Fowler is also a favorite of mine. I like Stephen. He did not leave a will, but his second wife Letticia petitioned the court to have his estate settled, and through this wonderful document, we learn much about him. Stephen was born circa 1798. We know for sure that he died in June 1866. He was first married to Sarah, and they had their six surviving children between 1816 to 1836. Sarah died shortly after the birth of her last child, and Stephen then married Letticia and had two children with her between 1840 to 1847. I will go more into detail on Stephen’s family another time, although I will say this before moving on: many researchers have been stumped when looking for the parents of Bryant, Shelton, Henry, and Morman Fowler. This document proves, once and for all, that Stephen Fowler was their father. Daughter Melinda “Milly” Fowler was Ephraim’s next child. Taking her age from the 1850, 1860, and 1870 census records, she was born circa 1799/1800. She married James Millwood and they raised their family of seven children in Union County. These children were born between the years 1822 to 1841. Milly died sometime between 1870 and 1880. Catherine “Caty” Fowler, was born circa 1801/1802. She was living when Ephraim made his will in 1822. I have not been able to spend the time necessary to find out any details about her. She is still a mystery to me. She was not mentioned in the estate settlements of her sister Mary Fowler White in 1861, or of her brother Stephen in 1866. I do not know if she ever married and had a different last name in census records. I do believe that she had died before 1861, and because of the fact that no children if hers were mentioned in the estate settlements of her two siblings, I feel that she may have not married and, in fact, may have died young. Ellis Fowler. One of the many Ellis Fowlers that continues to confuse researchers! This is the Ellis Fowler born circa 1805 who was the son of Ephraim Fowler. This is the Ellis Fowler who married Sarah “Sallie” Mabry and had children Elbert, Henry Richard, Julia, and Mary Jane. Throw away all of your research that says Ellis Fowler married to Sarah Mabry was the son of Henry Ellis Fowler, or the son of Ellis Fowler, Jr!! The documents that I have already included in this essay prove 100% that the Ellis married to Sarah Mabrey WAS the son of Ephraim Fowler. 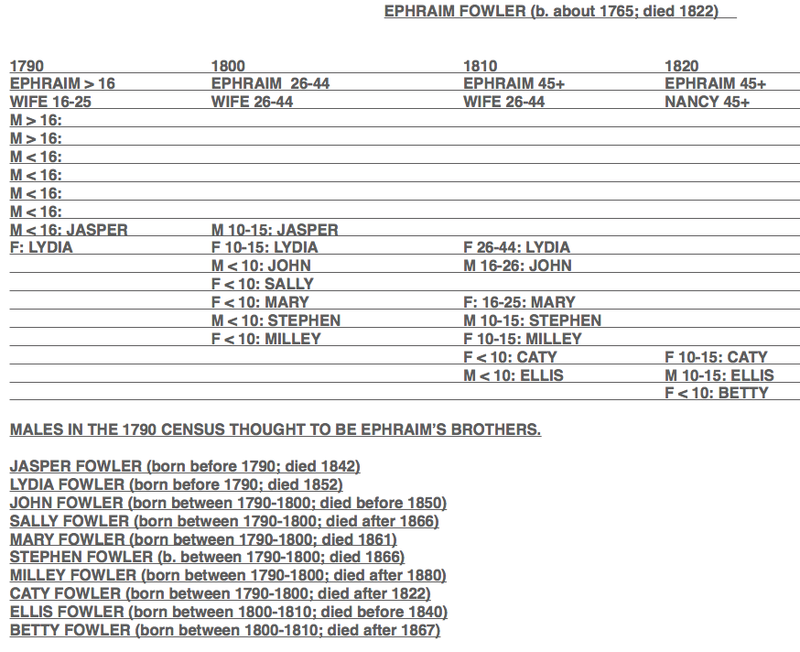 If you are descended from Henry Richard Fowler and Nancy Farr, or Mary Jane Fowler and Newton Lipsey, or Elbert Fowler, or William and Julia Fowler Sprouse, then you ARE descended from Ephraim Fowler!! I deduct from the above that children Ellis and Betty had not married by 1822 when the will was written. This also leads me to believe that they were the two youngest children of Ephraim and Nancy. Ellis was never to appear as head of household in any census record. He died before 1840, and his widow Sarah was listed as head of household with her two young daughters Julia and Mary Jane. She lived very near to her sister-in-law Sarah Hames and husband John. In 1850, Sarah Mabry Fowler was head of household living with son Henry Richard. She disappears from census records after 1850. Elizabeth “Betty/Betsy” Fowler was not included in the line-up of Ephraim’s children in his will. She was mentioned twice but neither mention gives us any real clues as to where she fits into the family. I like my theory that she was the youngest daughter, and I do believe that she was born circa 1815. Although my research on Elizabeth Fowler is not yet 100% documented, I am fairly certain that she married Richardson Bentley (1814-1843) in Union County circa 1830. Richardson Bentley was the son of William Bentley (1780-1845). Richardson and Elizabeth had a son, Lemuel, born in Union County in 1831. The family then moved to Blount County, Alabama where they had children Nancy Jane, Turner Richard, James W., Mary Elizabeth, Sarah, and Caroline. Elizabeth can be found in Blount County census records in 1850 and 1860 living with some of her children. I have not been able to find her after 1860. As a note of interest, Stephen Fowler’s widow Letticia Fowler was living with a Bentley family in Union County, SC in 1880. This Bentley family was related to Richardson Bentley though Richardson’s father. I’ll save that information for another time. So that, my fellow Fowler researchers, is a brief summary of the sons and daughters of Ephraim and Nancy Fowler. I have much more to share on these fine people of the past in my next installment of The Union County, SC Fowler Families! I will delve into the wills and estate settlements and land transactions in great detail. There will be a forthcoming essay on the many Ellis Fowlers of Union County. I will explore in depth the theories of Ephraim’s wife Nancy, and I’ll do my very best to keep it all interesting! Terrific research with detailed source information! Eager to see what follows!